This post briefly discusses the issues of arbitrage and interest rate parity. The insights summarised below are extremely useful in international economics. They are crucial to understanding the Mundell–Flemming Model of international economics, particularly in understanding the trilemma of international economics. Most macroeconomic books will have this discussion. If you are interested in learning more about these topics, beyond the the few articles provided above, I recommend “Macroeconomics” by Mankiw and “International Economics: Theory and Policy” by Krugman and Obsfeld for undergraduates, “Introducing Advanced Macroeconomics: Growth and Business Cycles” by Sorensen and Jacobsen for advanced undergraduates and “Interest and Prices: Foundations of a Theory of Monetary Policy” by Woodford for post-graduates. Therefore a country’s aggregate interest rate, will always be a function of its trading/financial partners and of the spot and future exchange rates between them. As a result, if the ECB increases interest rates and the Fed does not increase its own policy rates, then either the spot value of Euros (S€) will increase or the future value of Dollars (F$US) will decrease. While this is fine, if the opposite occurs and the Fed lowers interest rates, the ECB will have an incentive to lower the MRO or risk making the Euro-Zone less competitive in the short run. 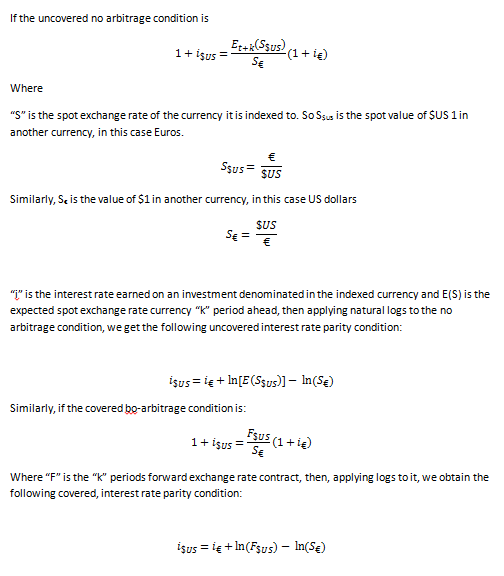 The seminal study in IRP is the 1984 article by Fama, “Forward and Spot Exchange rates“. The author finds that forward exchange rates’ time varying premia (which explain most of the variation of foward rates) and expected future spot rates components of foward rates are negatively correlated. Uncovered Interest-Rate Parity over the Past Two Centuries, by Lothian and Wu use a data set of estimated exchange and interest rates from the last 200 years and confirm that while IRP holds over the long run, in the short run there are divergences from IRP. In “Uncovered Interest Rate Parity and the Term Structure” Bekaert, Wei and Xing considering term structure drivers of UIRP deviations, argue that these are currency specific, rather than Short or Long term specific. In Long-horizon uncovered interest rate parity, Meredith and Chinn, “test UIP using interest rates on longer-maturity bonds for the G-7 countries. These long-horizon regressions yield much more support for UIP – all the coefficients on interest differentials are of the correct sign, and almost all are closer to the UIP value of unity than to the zero coefficient implied by the random walk hypothesis”. Explaining Deviations from Uncovered Interest Rate Parity, by Bacchetta explains these deviations from the model as being caused by “risk premium, limited market participation, and deviations from rational expectations”. An example of the risk premium argument is “Tests for a Systematic Risk Components in Deviations Fropm Uncovered Interest Rate Parity“, by Curdy and Morgan. According to Bacchetta, Predictability in Financial Markets: What Do Survey Expectations Tell Us? by Bacchetta, Mertens and van Wincoop, shows that “if investors have random walk expectations but trade frequently, high interest rate currencies depreciate much more than what UIP would predict”. Also,Capital Controls, Political Risk and Deviations from Interest-Rate Parity, by Dooley and Isaard provides a political answer to the problem, published before Fama’s 1984 insights. Finally, all these studies offer a vast list of complementary sources in their bibliographies, which should be consulted. This entry was posted in Uncategorized and tagged Arbitration, CIRP, Covered Interest Rate Parity, Exchange Rates, Interest Rate Parity, Interest rates, IRP, UIRP, Uncovered Interest Rate Parity. Bookmark the permalink.